I don’t think two posts counts as a recurring theme, but I need to use up some bananas. My husband alleges that he eats bananas all the time, but I’ve never seen any evidence of it. I sometimes give one to the Muffet on her way to school when she’s been too busy in the hour since she woke up to eat breakfast. Lying on the floor singing, losing your shoes and bothering your brothers takes up a lot of time. As it turns out, it appears that you can slap together any old combination of bananas, sugar, butter, eggs and flour and you’ll end up with some kind of cake. I pick a recipe from a school fundraiser cookbook that I have and give it a whirl. Remind me to take you on a tour of my cookbooks some time, sublime to the ridiculous just about covers it. I never have butter at room temperature, although not for any good reason – my Nanna used to keep butter in a covered ceramic butter dish on the kitchen bench and it was always fine. Especially if you go through scads of it, like I do. However. What you do is put your 125 grams of butter in a metal mixing dish and put it in the oven at 50 degrees while you go and hang out the washing. When you come back, add to it half a cup of caster sugar and a teaspoon of vanilla and beat with a fork until creamy. Or stick it in your Kitchen Aid if you’re a fancy pants with a giant marble clad kitchen. Beat in two eggs, one at a time. Squash in two overripe bananas and mash them in until there aren’t any bits for your fussy nine year old to complain about. Gently fold in 2 cups of plain flour and 4 teaspoons of baking powder. Or 2 cups of self raising flour if you haven’t been listening. Stir in half a cup of milk. Actually, I stirred in a quarter of a cup of sour cream and quarter of a cup of milk, and I’ll bet a half a cup of buttermilk would be pretty good too. Stir in 125 chocolate chips – nice ones, don’t even think of using supermarket ones you cheapskate. Scrape mixture into a loaf tin lined with baking paper. Baking paper revolutionized my life, I go through metres of it. Bake for about thirty five minutes at 160 degrees, and make sure you test it with a skewer, because banana fudge is not a thing. I’m definitely adding this one to the repertoire. 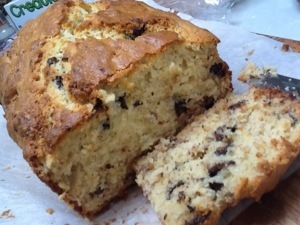 It wouldn’t quite be sweet enough without the chocolate chips, it’s light and moist with a crunchy crust and I’d seriously consider adding about a third of a cup of coconut flakes next time if it wasn’t for fear of audience backlash. You may not have such an exacting customer base. I make a very similar recipe, only using brown sugar instead of castor sugar. The recipe came from my friend Sandi who has more chldren than you and I combined. Her’s freezes really well, which makes it a great lunchbox filler. It also toasts beautifully. Another friend puts dates in instead of choc chips for an adult version. I couldn’t believe how many banana cake recipes there were once I started looking! I’ll have to try brown sugar next time.